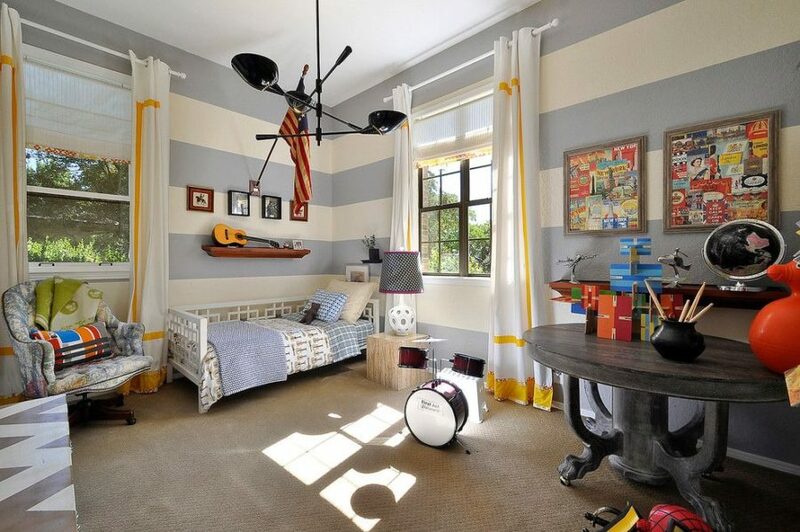 For the young wholesome All-American boy, this is the perfect bedroom. 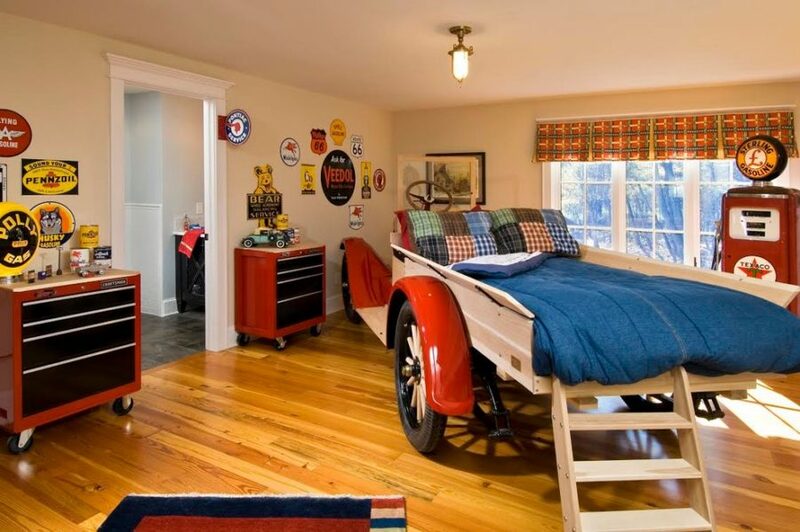 A DIY tractor trailer bed will be the coolest thing ever in a young boy’s eyes. Maintaining theme, tool box storage drawers serve as dresser drawers and an old gasoline pump adds a vintage touch of cool. 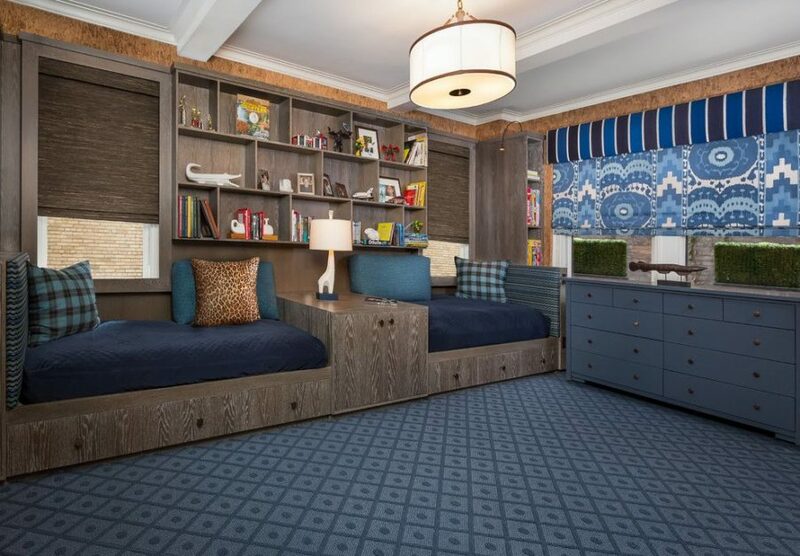 Plaid textiles and wood keep this bedroom feeling extra cozy too! For the young superhero, convert his bedroom into a superhero crash pad with a built in screen to a wall decked out in prints of his favourite movies and games. This bedroom has installed a room separator ‘secret agent style’ with a projector for the wall behind and built in controllers for games. He can easily draw up a chair there or lay back in bed and watch all the action. Heavy duty chains to hold and hang up a bed is another great touch to add to the superhero feeling of the space. For a bedroom to share, this room plays on traditional bunk beds and instead keeps them attached side by side against a wall console. 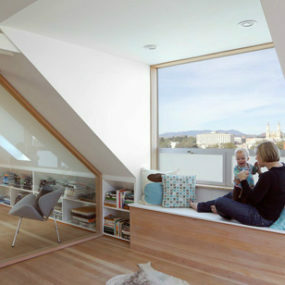 We love that the separator between the beds can be used as extra storage and a bed side table. The beds can also function as both couches and beds. For the little outdoor explorer, make him feel like he’s camping with a tent inspired bunk. We love the rustic weathered wood and canoe piece in the corner. 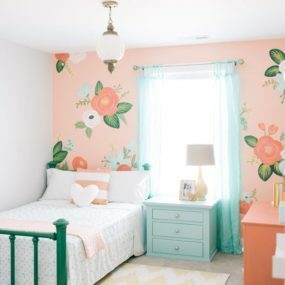 A fun patterned fish bed cover and colourful walls with geometric pine trees complete this adventurous room. Kids’ interests change over time as they grow. Designing a more neutral general design as opposed to sticking to a strong theme makes it easy to adjust things with him as he moves through different stages of childhood. A thick pale blue and white striped wall is a great neutral but youthful option. 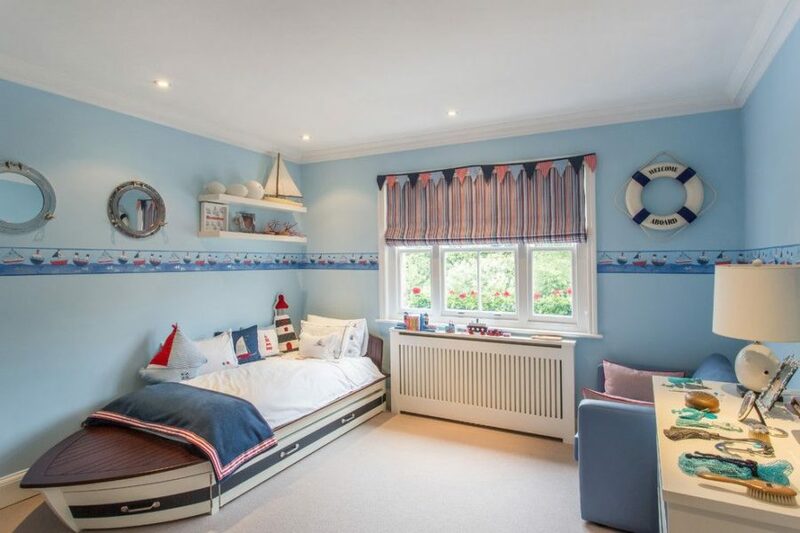 We love this adorable nautical themed bedroom for a toddler. 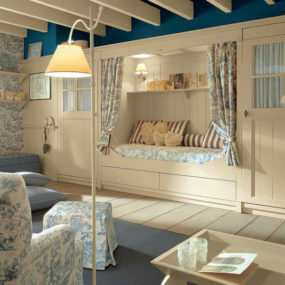 Paint the walls sky blue and decorate with sailor themed accents. Let a boat for a bed with under drawers as extra storage be the star of the show. An old fashioned white heater under the window is also a great feature of this room adding an extra ship-like feel to the space. For the mature teen or grown bachelor, it’s time to part ways with the youthful blues and introduce a new colour scheme. 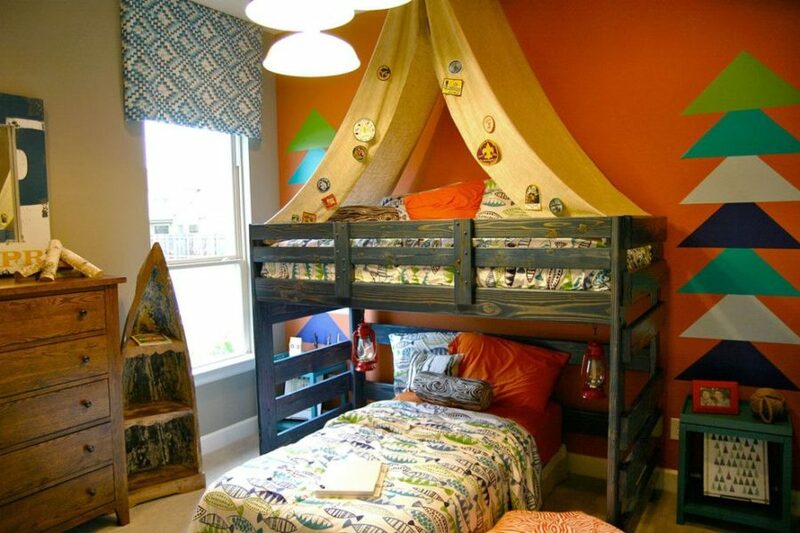 This room is perfect for the modern outdoorsy guy with burnt orange and charcoal greys. 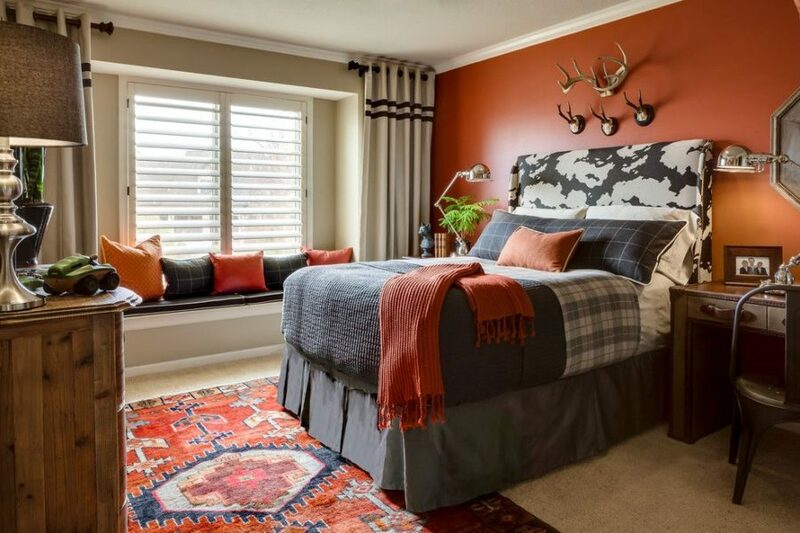 Pay attention to details like flannel plaid, a rugged carpet and dear antlers on the wall. A wooden or black headboard would be great here too but a camo patterned one makes a bold statement. 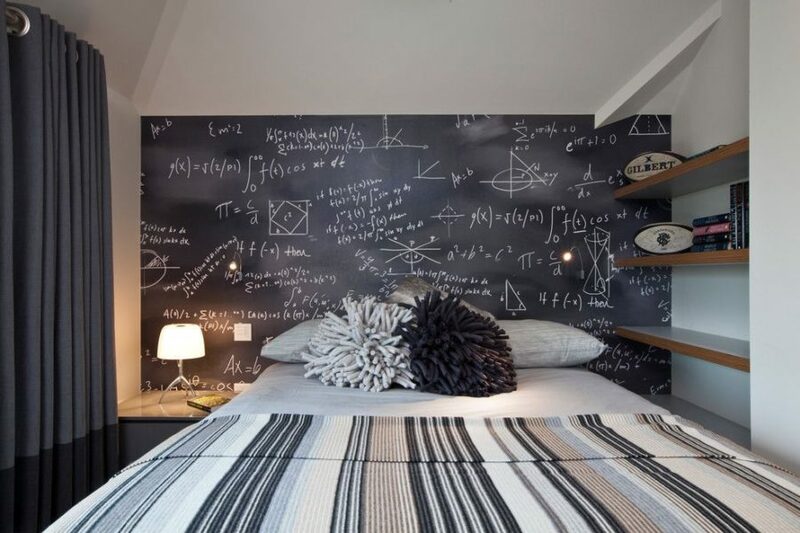 For the studious guy, give him a space he can think and create comfortably in. Simple shelving for books and a full chalkboard covered wall to scratch down thoughts and visualize are important and practical pieces in this room. A working bachelor will love this modern sleep space. 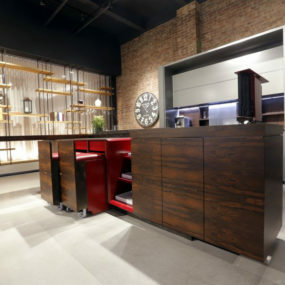 We love the abstract wooden wall piece and contemporary style furniture here. Futuristic design combined with traditional building elements like wood are also used on the wall art and a bed that appears to be a rocking bed but actually stays balanced and flat. 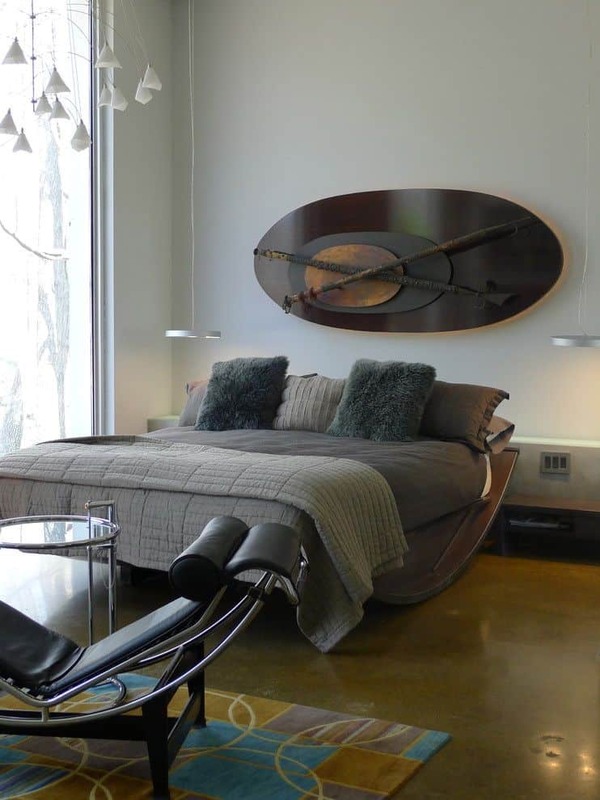 For a creative minded man, he’ll love this industrial Brooklyn loft style bedroom. 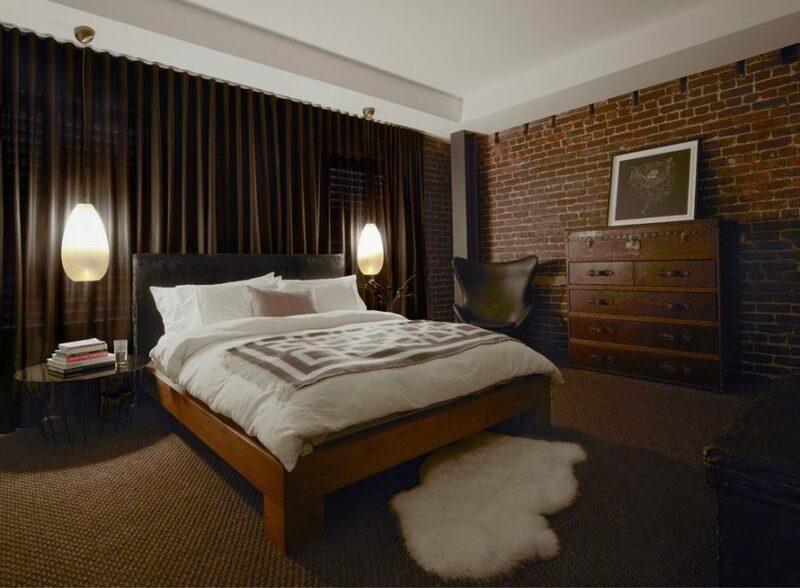 A single red brick wall with brown leather, dark woods, and crisp white work well together. Add an element of softness like a furry rug to balance things out. For the ultimate masculine fantasy room, this modern movie-like room is the model. Black walls, strategic spot lighting, black leather, and charcoal textiles give this room a dark and sophisticated look. Display luxury art pieces on an illuminated shelf and modern photographs on the wall. 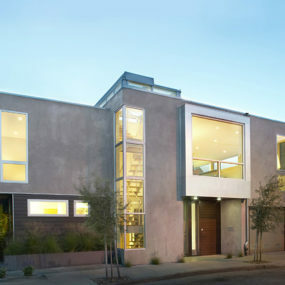 The only thing missing here is a contemporary fireplace and mini bar!